First, I'll admit I put off trying to make risotto for quite some time. Why? I thought it would be a difficult and finicky dish. The reality? It wasn't bad at all. As long as you remember to continue adding warmed broth you're good. I hope you give it a try. Oh, and don't reduce the recipe - because do you know how risotto leftovers are delicious? Why, as Crispy Risotto Cakes! 1 cup grated Parmesan cheesePut the oven rack on the middle shelf and heat the oven to 400 degrees. Bring the broth and bay leaves to a simmer in a medium-sized saucepan over medium-high heat. Cover the pot and keep the broth warm over the lowest possible heat. Meanwhile, melt the butter in a large saucepan over medium heat. Add the onion and ½ teaspoon of salt and cook until the onions brown, around 6 minutes. 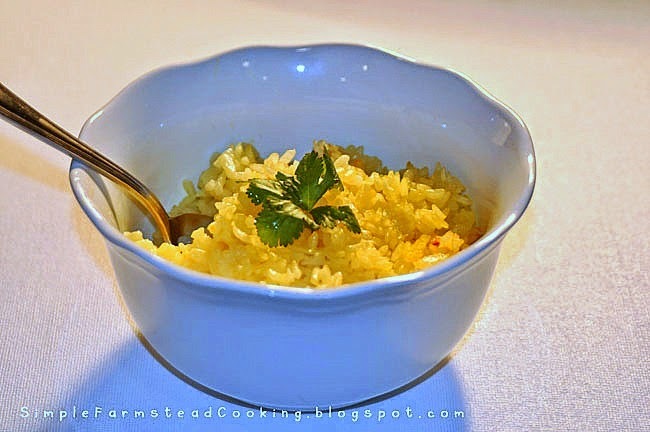 Add the rice, stirring, and cook it until the edges of the rice become translucent, about 2 minutes. Stir in garlic and saffron (if using) and cook for about 30 seconds, until you can smell it. Add the wine (or 1/2 c. broth) and stir until all the liquid is absorbed, about 2 minutes. Spread the rice mixture into a 13"x9" baking dish. Pour the reserved warm broth over the rice. Bake until the rice is tender and all the liquid is absorbed, about 25 - 35 minutes (longer if you added additional broth as noted above), carefully stirring the rice twice during the baking time so it all has the opportunity to absorb liquid. Pick out the bay leaves and stir in Parmesan cheese. Season with salt and pepper to taste. Oh yeah...I gotta try this one! Slurp!